Abdal (lit: substitutes) is a rank of forty saints, but more often the larger group of 356 saints in Sufi theosophy, only known to and appointed by Allah. It is through their operations that the world continues to exist. The term over time has come to include a greater hierarchy of saints, all of different rank and prestige. The Abdals are headed by their leader, "Al-Ghawth" ("the Helper"), who is said to reside in Mecca. This leader is often referred to as the Qutb, which means "Pole" in Arabic. This leader though unknown to the public is usually sought out by all of the lower ranking members of the abdal. At various times in history, shaykhs have been known to publicly claim to be the Qutb, despite the tradition of remaining outside of the public eye. The missions of the Abdals are, to be God's merciful subjects everywhere they reside and to render the helping blessing hand to all of God's creatures. It is said that a Badal exists in each continent. Although the majority live in "Al-Sham (Syria),"...some live in Iraq, some in Lebanon, some in Egypt, some in Antioch, some in al-Massisa, and others live throughout the rest of the world.". They have divine powers and super-natural abilities. A person does not recognize that he is one of the Abdal until he becomes aware of his status suddenly though a revelation. It is said that a Badal can be identified through, his continuous good deeds and forgiving nature. He may be rich or poor, married or bachelor, child or adult. 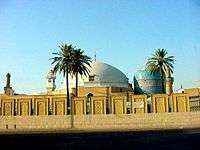 Such concepts are established in the Sunni branch of Islam, and in particular in the latter’s original Sufi schools of spiritual disciplines. As far as the number of the abdal is concerned, there are 300 friends of Allah in the creation whose hearts are like that of Adam ‘alaihis salam. There are 40 whose hearts are similar to the heart of Musa ‘alaihis salam and 7 whose hearts are similar to the heart of Ibrahim ‘alaihis salam. There are 5 whose hearts are like that of Jibra’il and 3 whose hearts are like that of Mika’il and one whose heart is like the heart of Israfil. When he (whose heart is like Israfil) dies, then one of the three whose heart is like Mika’il replaces him and one of the five (whose hearts are like Jibra’il) replaces him. One of the seven replaces one of the five, one of the forty replaces one of the seven and one of the three-hundred replaces one of the forty and a normal Muslim replaces one of the three-hundred. It is due to these 356 awliya that creation are given life and killed, due to them rain falls, vegetation grows and difficulties are removed. It is also believed that since the number of abdal is so near to the number of days in the lunar calendar, their role as a part of the cosmic order of the universe is justified. ↑ Metcalf, Barbara Daly (1996). 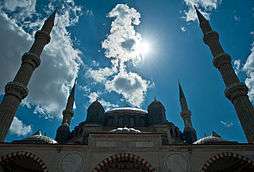 Making Muslim space in North America and Europe. University of California Press. p. 178. ISBN 0-520-20404-2. 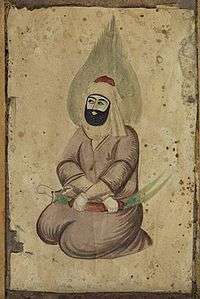 The centrality of a Sufi saint's power over the earth and nature is explicitly personified in Sufi theosophy by the mystical rank of abdal, part of the esoteric set of beliefs regarding the ranked community of saints. According to this set of beliefs, there are at any one time forty living saints in the world who are abdals. These saints, I was told, make the grass grow, give food to birds, and ensure the fertility of the earth. ↑ Zarrinkoob, Abdol-Hosein (1970). "Persian Sufism in Its Historical Perspective". Iranian Studies. 3 (3/4): 198. doi:10.1080/00210867008701404. JSTOR 4310072. ↑ Chabbi, J. "Abdal". Encyclopedia Iranica. Archived from the original on 29 April 2011. Retrieved 7 April 2011. ↑ Zarrinkoob, Abdol-Hosein (1970). "Persian Sufism in Its Historical Perspective". Iranian Studies. 3 (3/4): 197. doi:10.1080/00210867008701404. JSTOR 4310072. ↑ Jones, Lindsay (2005). Encyclopedia of Religion, Second Edition. Farmington Hills, MI: Thomson Gale. p. 8821. ISBN 0-02-865733-0.